A regular saw can be quite heavy and cumbersome to use. That is why small circular saws are gaining popularity over time. They are compact, lightweight, and ergonomic. Despite their small sizes, they deliver the same functionality as a regular saw. The best thing about a small circular saw is that you can comfortably use it in one hand without much fatigue. Moreover, it makes a good choice for cuts in tight spaces and small tasks at home. If you are in a position to get one, you will be faced with a tough decision to make, given that there are plenty of options available on the market. But with the following top 11 best small circular saws reviews, getting the right one will be a breeze. For bigger cutting projects, consider the SKIL 5180-01 Circular Saw. It features a 14-amp motor for more power and performance. It also has an improved dust blower to keep the line of cut free of sawdust. Weighing 7.2lbs, the circular saw is much lighter compared to others in the same category. Thus, it is easier and comfortable to use. It is equipped with a power-on indicator, so you can see when it is powered on. As a safety mechanism, this circular saw boasts a guarded trigger to reduce accidents during startups. When it’s time for your next project, you’d better get ready with the SKILSAW SPT67WL-01 Sidewinder Circular Saw. Designed with a durable magnesium guard footplate, this model can endure the rigors of heavy-duty projects. And the dual-field motor is to keep the saw cool through the toughest cuts. The unit features a 10ft cord that will help prevent snagging on sheet goods while ripping. The motor is 15Amp to ensure optimum power for every demanding cut. For maximum performance, this circular saw has an integrated dust blower to keep clear the cutting line for accuracy. 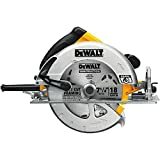 The DEWALT DWE575SB Circular Saw is 7.2 inches in width and weighs 8.8lbs. Regardless of its small size, this machine delivers the maximum power needed to perform some of the most demanding tasks. For extra durability, this unit is equipped with tough cord system to provide 3 times resistance to cord pullouts. It has ergonomic trigger actuation and handles to enhance comfort and balance during use. Moreover, it features an electric brake that stops soon, after the trigger is released, to provide additional safety. For a saw that can cut through any material, go for the Genesis GCS545C Circular Saw. With 5.8 Amp motor, this circular saw is powerful enough to cut through hardwood, composite, softwood, copper, and aluminum materials. The compact, lightweight design is to ensure maximum comfort for easy use. And the ergonomic construction provides control grip for the convenience of a single-hand operation. It is for this reason that this tool is reliable for tight spots and awkward cuts. Furthermore, this saw has a dust collection adaptor to keep your working area clean. 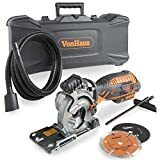 Make professional-grade cuts into ceramic tiles or wood with the VONHAUS Corded Circular Saw. Featuring a 3.5” blade diameter and a 5.8 Amp motor, this tool delivers the power needed to tackle rips and plunges. The ergonomic design combines slim grip handle with rear motor construction to improve comfort for accurate operation. Also, it has a long cord length that will allow you to work with more freedom, unlike a shorter one. Plus it features a long dust extraction that will keep the cut line clear of dust for more visibility and better results. Cut any type of material with the Rotorazer Platinum Circular Saw. It is equipped with multiple saw blades to cut through a wide range of materials. Besides, it is well-crafted to let you cut in any direction unlike other saws in the same class. The circular saw also has an adjustable depth lever, which will allow you to choose the depth of your cut. Choices are deep, shallow and medium cuts. For this reason, this saw makes the perfect option for tight spots and drywall. 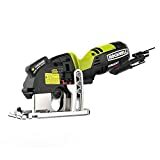 And to avoid getting sawdust all over the place; this saw is equipped with a dust extraction hose that is compatible with any household vacuum. 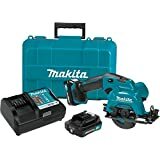 Weighing only 3.5lbs, the Makita Cordless Circular Saw kit (SH02R1) is compact and lightweight. It makes a perfect choice for individuals who prioritize single-handed operation. Despite its small size, this saw has 1500 PRM which is sufficient for cutting into plywood, melamine, and drywall, among others. The handle is ergonomically designed with rubber for soft grip and maximum comfort during use. But that’s not all; the saw has blade wrench attached for quick and convenient blade changing. Not to mention the battery protection circuit that protects against overloading and over-discharging. Use just one hand to control intricate cuts with the Rockwell RK3440K Versacut Circular Saw. The streamlined design combines well with laser guide technology to give you precise cutting every time. Besides, this circular saw has a dust extraction attachment to keep clear the cutting line for accurate cutting. For extended saw life, the unit is made of a durable interior and exterior guard. And there is a depth adjustment lever, which allows you to make cut changes with no effort at all. This powerful saw is also compact and lightweight; hence, cutting through tight spots will not be a problem. With a highly-inventive voltage changing battery, the DEWALT FLEXVOLT Circular Saw has the power to perform all kinds of cutting. It boasts a unique battery that changes voltage when you change tools. For additional safety, this saw has an electronic brake that comes to a stop once the trigger is released. It uses brushless motor technology for maximum runtime and durability. Ideally, this circular saw delivers 500 RPM for quality cuts with speed. Better still, the model features a full-length blade for maximum performance. And the bevel cut capacity can go up to 57 degrees. 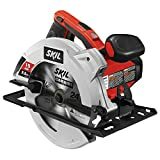 If you’re looking for a saw with advanced features and more power, the SKIL 5280-01 Circular Saw is your go-to product. It is designed with a single beam laser to guide straight cuts. And knowing if the power is on for use is now easier; thanks to the indicator light. For more convenience, the dust blower mechanism will ensure the cut line is clear for accurate cutting. Similarly, the trigger is guarded to minimize chances of accidental startups. This saw is designed to reduce user fatigue. Therefore, it features up to 15% weight reduction. Moreover, it comes with a carrying bag for easy storage and portability. With 50% less weight compared to an ordinary circular saw, the WORX WX429L Circular Saw can cut 2x4s in a single pass. It features thin blade for less stool strain and efficient cutting. This, thereby, results into a full-size circular saw with high performance and cutting speed. Ideally, this saw is compact for easy maneuverability and portability. It boasts a left-sided blade to enhance cut line visibility. For control, comfort, and balance, this model has a grip integrated with safety trigger. Besides, it offers quick adjustments; all thanks to the easy set depth gauge lever. The best small circular saw will be a great addition to your toolbox. The following reviews entail details of the best performing small circular saws. Whether you want to buy one for the first time or simply need to replace your old one, this compilation will give you the information you need. So, make sure you read it. A small circular saw has numerous benefits you had no idea about. The following are just but a few. Take a look. Technically, a small circular saw is 50-percent lighter than a regular saw. It is for this reason that a small circular saw can be used single-handedly. Even though small, this tool can still deliver enough power for fast cutting, just like a regular saw. Also, its lightweight design helps reduce user fatigue. The advantage of using a small circular saw over a regular saw is the ergonomic design. The handles, for instance, is designed to improve comfort while enhancing grip and control. Thus, you have enough power and strength to cut through any material in just one hand. Furthermore, the handle is a good fit in the hand for better performance. A small circular saw is compact and easy to maneuver. It is for this reason that it makes a good choice for cutting in tight spots where a regular saw cannot fit. Also, a circular saw is easy to move around for overhead and vertical cuts. In short, it lets you cut in multiple directions. 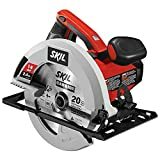 Whether you are a professional or just an enthusiastic DIY guy, these reviews will help you discover why you need a small circular saw and not the regular one. We hope you get one out of these 11 best.